If you own different warehouses you might want to transfer goods from one warehouse to the other. This is very easy thanks to the inventory application in Odoo. First of all you have to select the multi locations option. Go to Configuration ‣ Settings in the Inventory application. Then tick the Manage several locations per warehouse option. Please don't forget to apply your changes. This option should also be ticked if you wish to manage different locations and routes in your warehouse. The next step is to create your new warehouse. In the Inventory application click on Configuration ‣ Warehouse Management ‣ Warehouses. You are now able to create your warehouse by clicking on Create. Fill in a Warehouse Name and a Short Name. The short name is 5 characters maximum. please note that the Short Name is very important as it will appear on your transfer orders and other warehouse documents. It might be smart to use an understandable one (e.g. : WH/[first letters of location]). If you go back to your dashboard, new operations will automatically have been generated for your new warehouse. If you create a new warehouse you might already have an existing physical inventory in it. 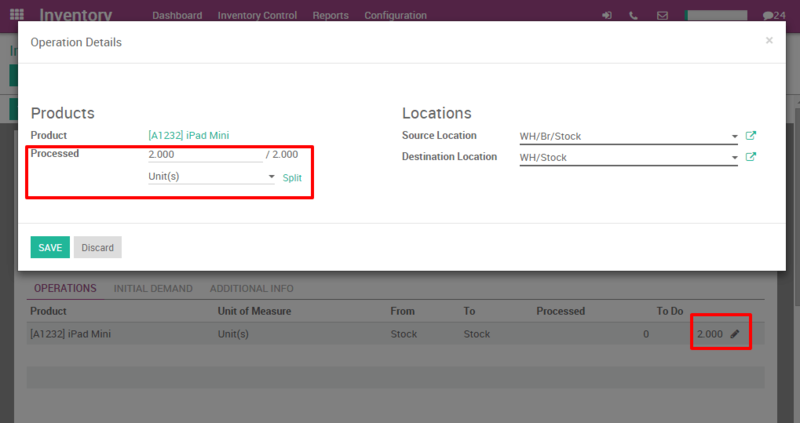 In that case you should create an inventory in Odoo, if not you can skip this step. Go into the inventory application, select Inventory Control ‣ Inventory Adjustment. You can then create a new inventory by clicking on Create. Fill in the Inventory Reference, Date and be sure to select the right warehouse and location. Next, click on Start Inventory. A new window will open where you will be able to input your existing products. Select add an item and indicate the Real Quantity available in the warehouse. The theoretical quantity can not be changed as it represents a computed quantity from purchase and sales orders. Don't forget to validate your inventory once you have recorder the state of all yours product. From your dashboard, select a internal movement of one of the two warehouses. To do so, click on More ‣ Transfer. A new window will open where you will be able to select the source location zone (in this case our "old warehouse") and the destination location zone (in this case our "new" warehouse located in Brussels). Add the products you want to transfer by clicking on Add an Item and don't forget to Validate or Mark as TODO once you are done. 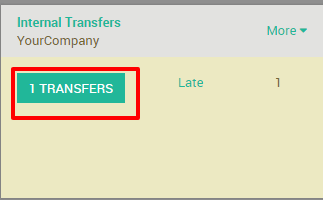 If you select Validate, Odoo will process all quantities to transfer. If you select Mark as TODO, Odoo will put the transfer in Waiting Availability status. Click on Reserve to reserve the amount of products in your source warehouse. 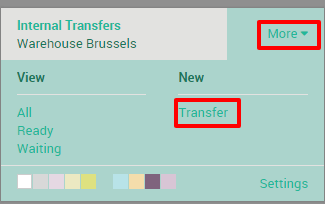 Via your dashboard, select the transfer order in the source location. If you decide to partially process the transfer order (e.g. 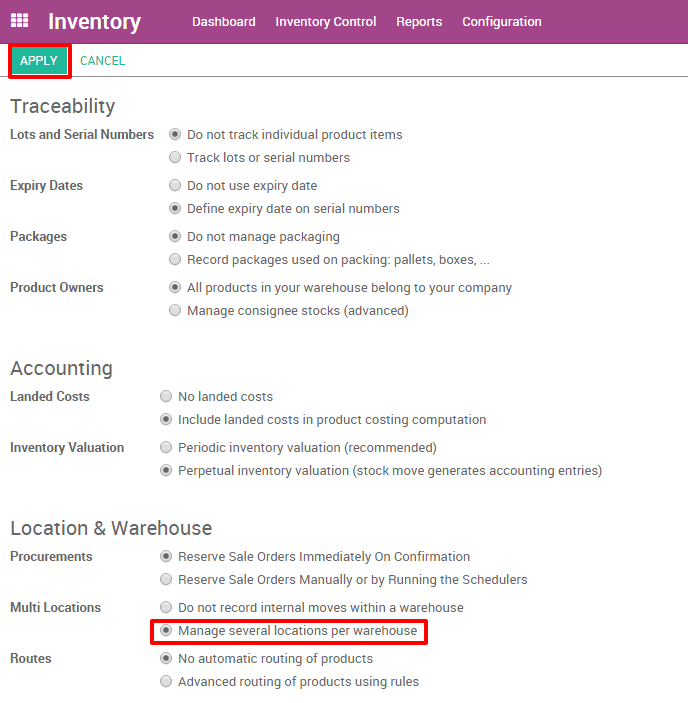 a part of the products can't be shipped yet due to an unexpected event), Odoo will automatically ask if you wish to create a backorder. Create a backorder if you expect to process the remaining products later, do not create a backorder if you will not supply/receive the remaining products.